5.1 How far is Delhi to Jaipur? 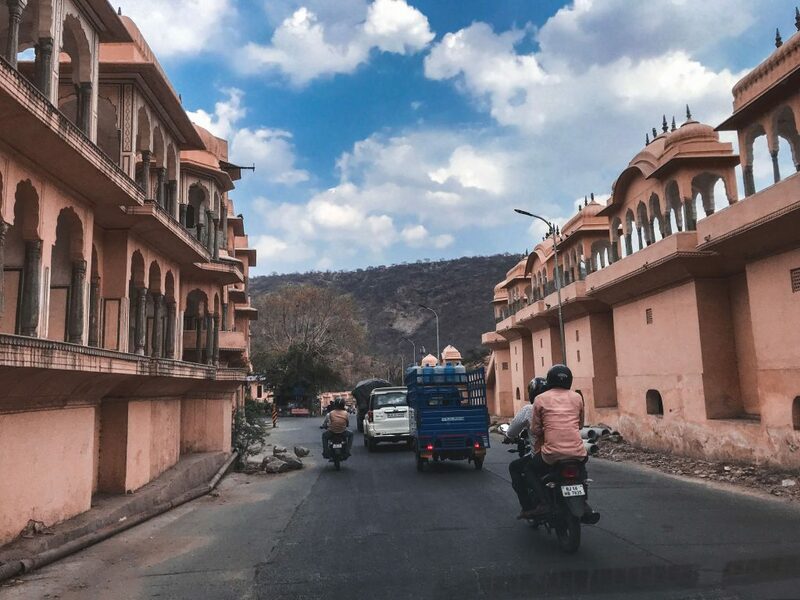 Jaipur is one of the biggest and most bustling cities in India and is a popular destination among foreigners and locals alike because of its beauty—the city is fondly called the “Pink City”, and the “City of Gems”. The name stems from the vibrant pink hue that washes over the skyline during sunsets because of the pink-tinted material used to build a majority of the buildings. 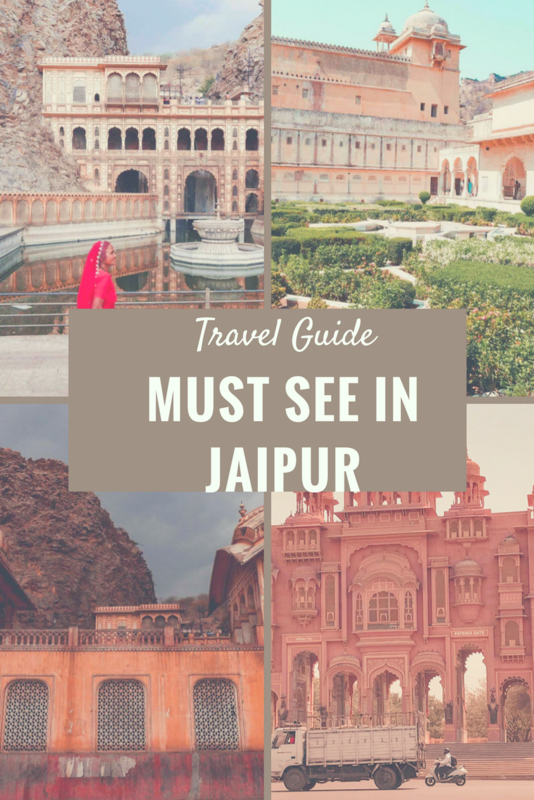 As you go through this blog, you’ll find out exactly why Jaipur is such a lovely place to book a trip. It is also famous for their carpets, gems, and traditional blow painting, as well as many more rich and culture-filled sights and activities. The Amber Fort, which is also known as the Amer Fort, is a perfect example of Jaipur’s history and beauty. It is located in Amer, Rajasthan, around 11 kilometres north of the city of Jaipur. 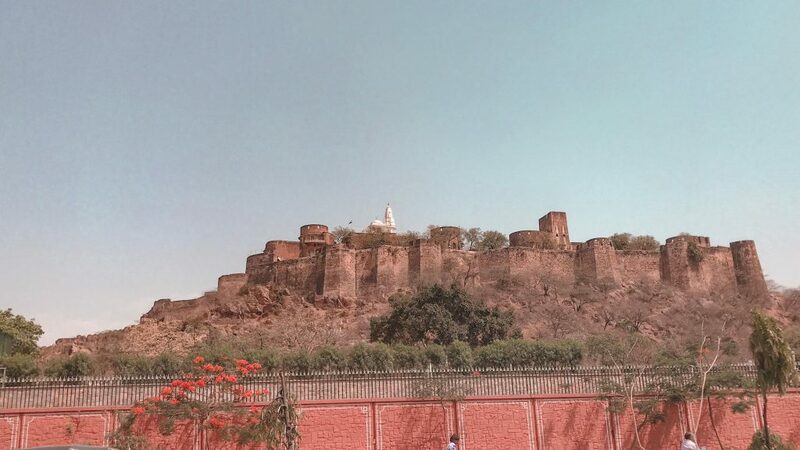 The fort has a lot of history behind it, it used to be the capital city of one of India’s ancient states – Kachawahas under the rule of Sawai Jai Singh II, despite having quite a tiny size at 4 square kilometres. It used to be a palace where Indian royalty and their families used to live. 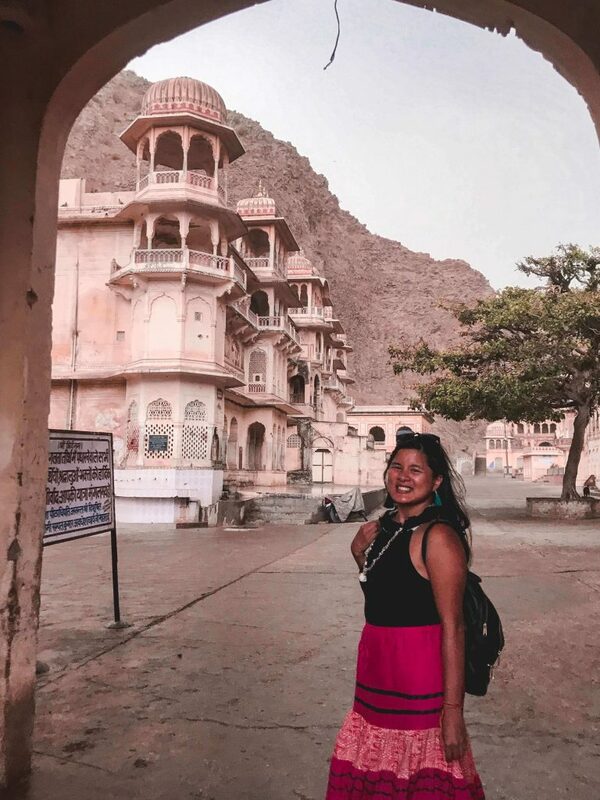 It’s also located on a very high hill which makes it hard to reach by foot but thankfully, the area has lots of transportation help so locals and foreigners alike can explore one of the most prominent symbols of the culture of Jaipur. I loved this a lot – it’s like a place with a thousand mirrors to mirror the night sky, it was really really nice. This is definitely one of the places to see in Jaipur. 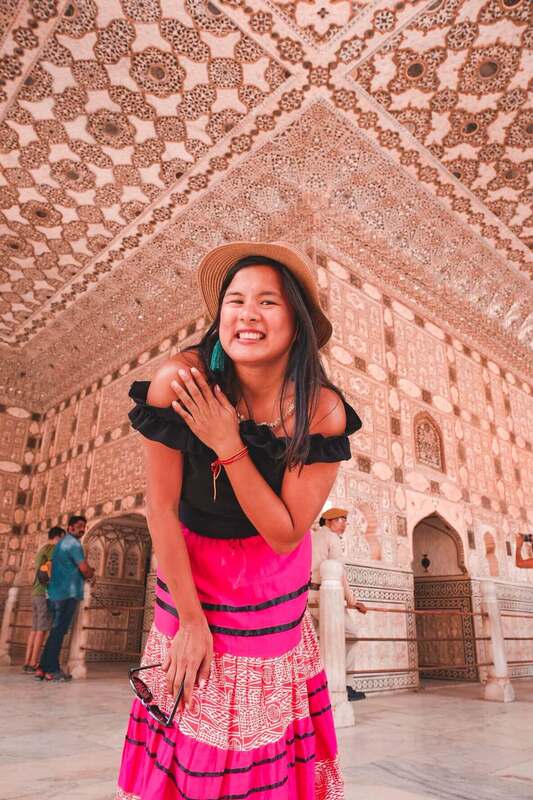 In order to have a more in-depth understanding of Amber Fort as well as the various things to see inside it, I decided to ask for a guide. The guide costs 200 rupees – I had Salim, an excellent photographer who was really good at English. He has been working there for a while, along with his grandfather, so he knows a lot about the different palace secrets and all that. Another cool fact about the Amber fort is that it is surrounded by long, tall and outstretched walls which were used in the ancient times to keep the fort safe from outside invaders, just like the Great Wall of China – in fact, the walls surrounding the Amber fort is the third largest in the world. Because of its beauty and deep roots in ancient Indian culture, the Amber Fort has also been declared a UNESCO World Heritage site. The area is so popular that is receives 5000 visitors on average daily. The Amber Fort is open from 8:30 AM to 5:00 PM. These fees are inclusive of a full admission to the Amber Fort, as well as other popular sites near the location. By car – To get to the fort, you can hail a car or a cab back and drive up to the back-side entrance. By Elephant – front side entrance which costs around 1000 – 1100 rupees. Personally, I didn’t take the elephant route – I took the car route. The ride takes around 20 – 30 minutes and they only go from the bottom of the hill to the top, not vice versa. The elephant rides are available from 9:30 AM to 1:00 PM. As much as possible it is good to arrive early to secure an elephant ride, as they tend to be quite popular – lines get long, especially if you’re late. The palace has three different gates – the Sun gate, the Moon gate, and the Lion gate. The Sun gate, also known as Suraj Pol, is where you will arrive if you went to the Amber fort via the elephants. It is called the Sun gate because it faces the direction of the sun when it rises – the East. This is also the main entrance. Back in the old days, this gate was strictly for the kings and the royal family only – hence why it was heavily guarded. The Sun gate also leads to the main courtyard, where men usually headed to right after their battles to show off their spoils and loot after their fights. The women in the buildings above would usually watch them do so. The Moon gate, on the other hand, is the landing spot for people who arrived via car or some other vehicle. It is also referred to as Chand Pol and is right at the opposite end of the main courtyard. Back when the fort was still the capital, the Moon gate is where the commoners were allowed to pass through. The Lion gate (also known as Singh Pol) is the gateway to the palace proper, a.k.a the private quarters of the royal family. The reason it is called the lion gate is because it is an animal which symbolises strength – there used to be lots of guards and sentinels watching over the gate to make sure no intruders came by. Unlike the other gates, the paths in the lion gate are winding – an extra measure to make sure no unwanted visitors would be able to storm the palace grounds. The First Courtyard – The first courtyard is known as the Jaleb Chowk. This is where soldiers of the King used to parade around and show off their weapons and prizes from wars. The Suhag Mandir, located above the gate, was where the ladies of the palace used to watch the soldiers through the windows. Here there are also steps leading to the main palace and the Sila Devi temple. 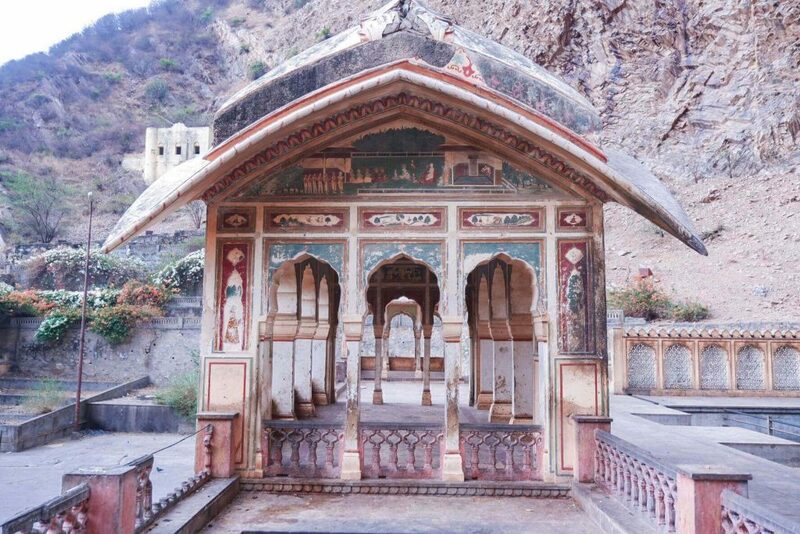 The Sila Devi temple is where the Rajput Maharajas used to practice their worship, their rituals often even involving animal sacrifice. Nowadays, though, the practice is banned. 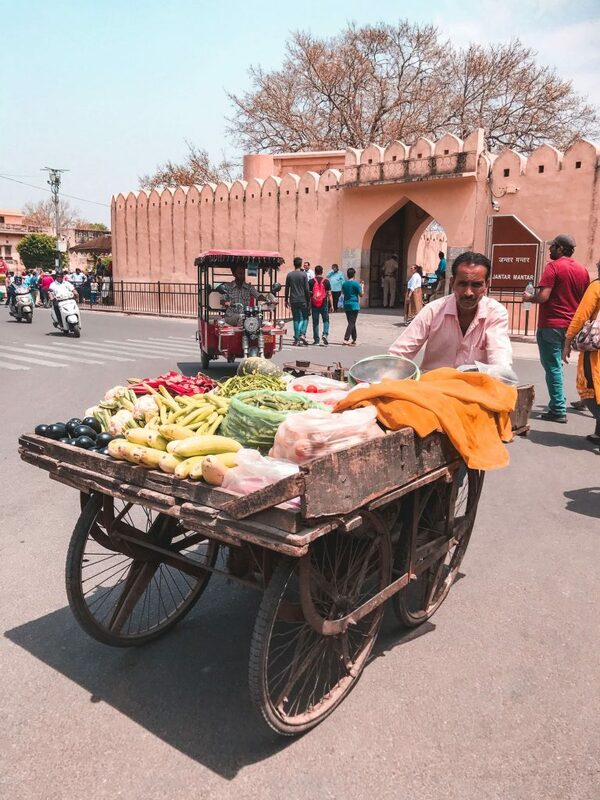 The Second Courtyard – Here you will find the Diwan-i-Aam, the public audience hall back in the day where the royal family entertained commoners as well as other visitors. It is an open hall surrounded by many pillars, decorated grandly with ancient Indian designs. – the famous Seesh Mahal, a mirror palace with intricate glass art and wall paintings. It is said than when you light two candles in this mahal, the walls glitter just like the night stars. – Opposite to the Seesh Mahal is the Sukh Niwas, the hall of pleasure. The interiors and windows are designed to let cool air flow even in the hot summer months. – The Palace of Man Singh, the main palace which took a whopping 25 years to build. The Fourth Courtyard – In the fourth courtyard is where the Zenana region is located. The King’s queens and mistresses all lived together in this area, along with their mothers and attendants. One interesting fact was that polygamy was rampant during the ancient times – one king even had 12 queens and 364 concubines. There are so many sights and sounds around the Amber Fort, but a good way to end the tour of the palace is via the popular light shows at the bottom of the hill, near the Maota Lake. The fort is illuminated in beautiful lights from 7:00 PM to 11:00 PM, and you can have dinner while learning all about the history and interesting bits of trivia about the fort. I didn’t see this but my guide said it’s beautiful. The Jagragh Fort, also known as the Victory Fort, is another fort in the area, much higher up on the Aravalli hill ranges than Fort Amber. It was actually built by Jai Singh II for the purpose of protecting Fort Amber and for storing and producing weapons. 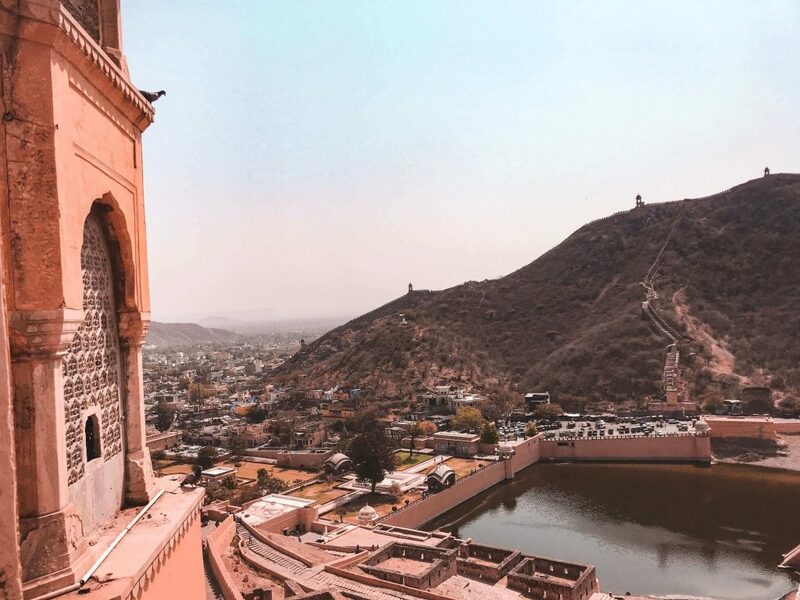 Additionally, it also has an underground passage connecting to the Amber Fort, so the royal family during the old times could flee uphill if ever there was an attack on the main palace. The underground passage isn’t available for public use and sightseeing, however. It is surrounded by beautiful walls spanning three kilometres, made out of striking red sandstone. Even though it was only three kilometres, it felt like the walls were going on forever and ever. 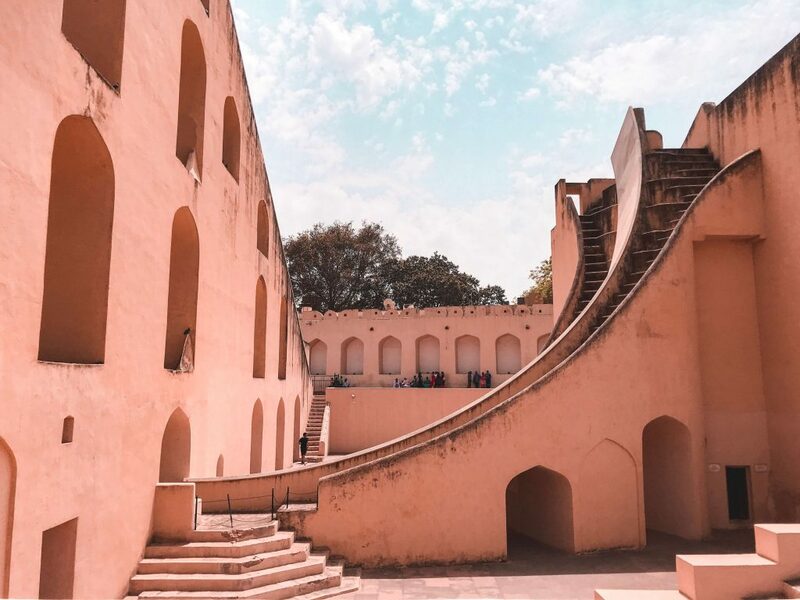 Jaivana – It is a well-known fact that the Jaragh Fort was used for building weapons – the world’s largest cannon on wheels, the Jaivana, was built here. A fun bit of trivia is that the cannon wasn’t actually ever used in battle – it was just tested once. They also have a museum and foundry where you can take a look at the ancient weapons – pictures are not permitted here, however. Laxmi Vilas – The Laxmi Vilas is the palace area at the fort. There are two components – the parade ground where armies used to meet and plan battle and defense strategies, and the royal drawing room of the King, which is decorated in lavish floorings and wall decor. Unfortunately, visitors are not allowed to go inside the drawing room – you’re free to take pictures, however. 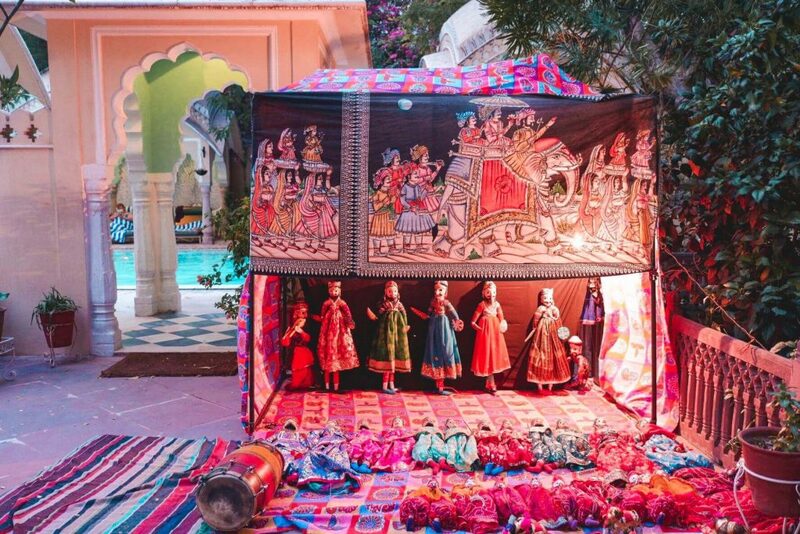 Lalit Mandir – Here you will find the royal entertainment area where you can watch a puppet show and even buy some to take home. There is also a recreated dining area to show tourists tidbits of everyday life in Ancient India. 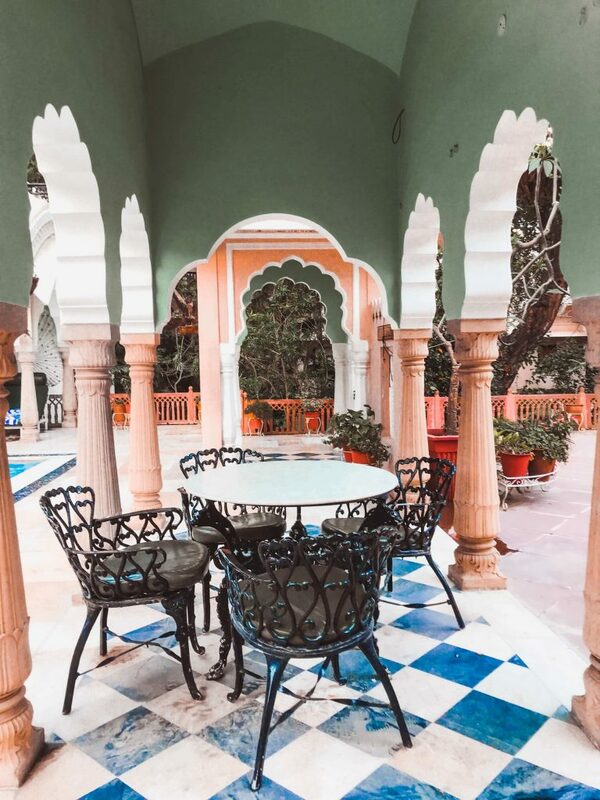 Aaram Bagh – The Aaram Bagh is a beautiful, lush green garden which is a delight to walk through – it has spectacular views of the city down below as well as the facade of the Jagragh Fort. The Jagragh Fort is open from 9 AM to 5 PM. Keep in mind that there are charges for taking pictures. The Jal Mahal, or Water Palace, is a beautiful palace that looks as if it is is already half submerged in the Sagar Lake – in fact, even though it seems like you’re looking at the entire structure, four stories of the palace are already underwater. Water surrounds it, making the structure look all the more mysterious and beautiful. It was built by Maharaja Madho Singh I who meant for the palace to be his own personal lodge when he and his entourage went out duck hunting. Afterwards, his son improved the exterior, making the Jal Mahal the beautiful piece of Indian architecture we all know and love today. This Mahal is, unfortunately, only accessible by boat – there used to be gondolas able to go near it but that was discontinued. 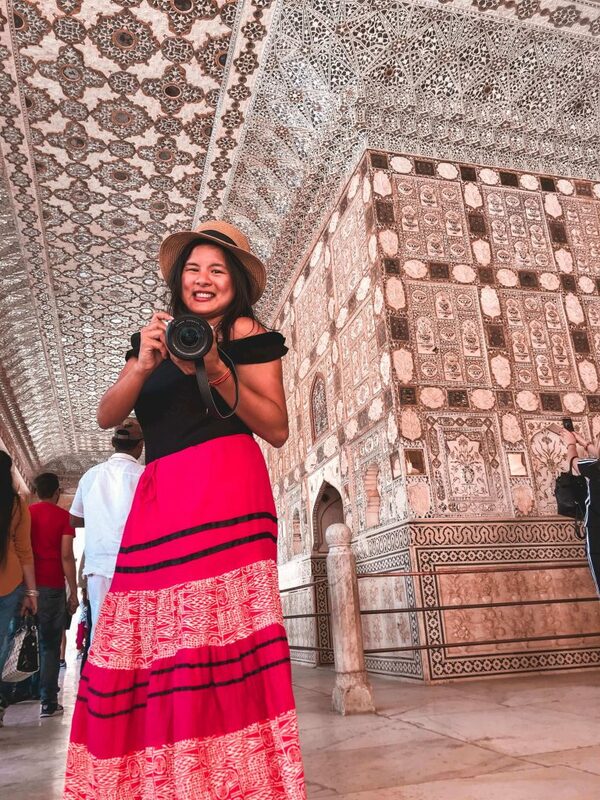 You can still take pictures, however – But when I was there someone offered to take my picture wearing a Rajasthan costume for 100 rupees including the dress. My car driver from Avishkarindia who was doing an excellent job in touring me around said that it usually only costs 50 rupees. But then again, I wanted the man to earn some money and 100 rupees isn’t too bad for a photo and to wear the dress. Tip: He will insist that you pay 100 rupees per photo that he clicks. I stood my ground and told him to print just one – he ended up printing two. He didn’t listen despite me being adamant about it, and I firmly told him that 100 rupees was my only and final budget. I ended up paying him 120 rupees just to be over and done with, but my point is try and stand your ground because some of the services around the area will try and get more out of you. I don’t think they mean harm, though – they just want business. They even ended up taking selfies with me. But, whatever, it was a good price and I had the money to spare – charge it to being a tourist. The pathway outside the Jal Mahal has no entry fee – feel free to take as many pictures as you’d like – the best ones are during the sunrise or the sunset, where you can get a picture of the palace with a beautiful, multicolored background with the pink hue of Jaipur. There are lots of stalls and restaurants around the area where you can grab a bite to eat. 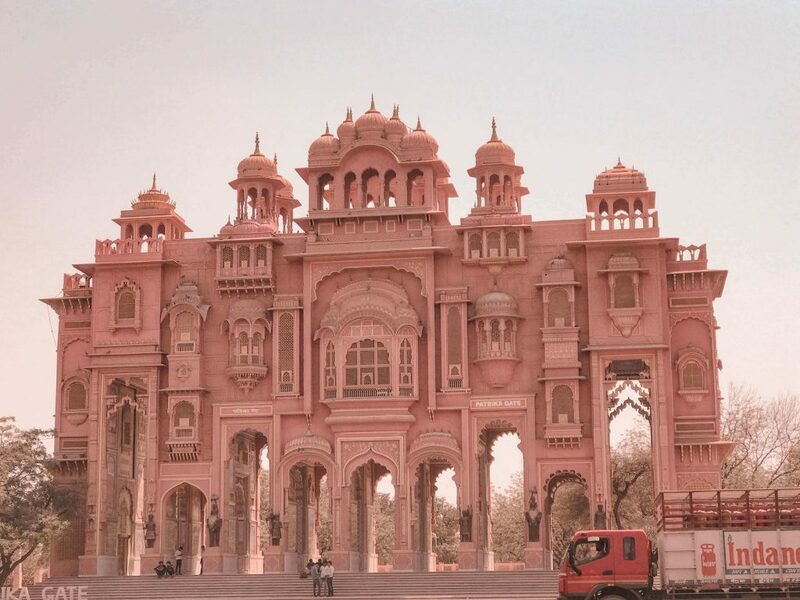 The Hawa Mahal, translated as the Palace of the Winds, is one of the most grand palaces in Jaipur, five stories high and built with red and pink sandstone that really makes it stand out from the baby blue skies in the background. It has a pyramid shape which was meant to resemble the crown of the lord and a grand total of 953 windows of intricate design. The palace was built in 1799 by Maharaja Sawai Pratap Singh and designed by Lal Chand Ustad. 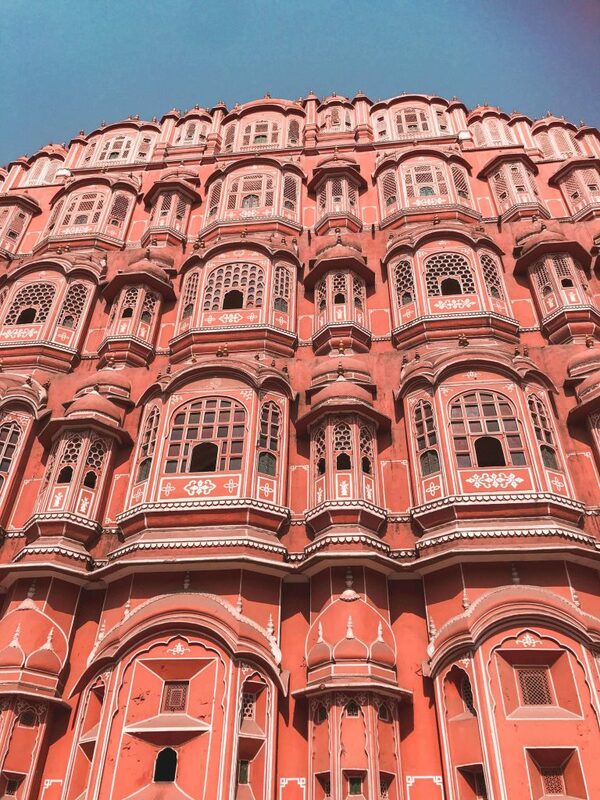 The reason the Hawa Mahal was built was to house the royal ladies, allowing them to see and watch over the streets and the happenings of day-to-day life without being seen by the public eye – the lattice work on the windows prevents people from seeing inside the windows, after all. When sunlight enters through the colorful windows, the inside of the palace lights up with a myriad of colors which is really a sight to behold. The top of the mahal offers wonderful views of the city from all sides. During the sunset and the sunrise, light hits the building which makes for beautiful pictures of the pink hued exterior. There is also a small museum you can visit from Saturdays to Thursdays with lots of relics and artefacts from the 1700s. The Hawa Mahal is open from 9:30 AM to 4:30 PM. Shri Sitaram Temple – This temple is one of the oldest structures in Jaipur, and it is even said to be older than the city itself. It is an old, ordinary looking temple but when you think about the fact that it has never once been renovated during the hundreds of years it has been standing, it makes the experience all the more interesting. Johari Bazaar – The Johari Bazaar is a jewellery market and a great place to buy some souvenirs – this is where the local crafters exhibit and sell their works of the meenakari technique, a type of glazed enamelling which is a speciality of Jaipur. 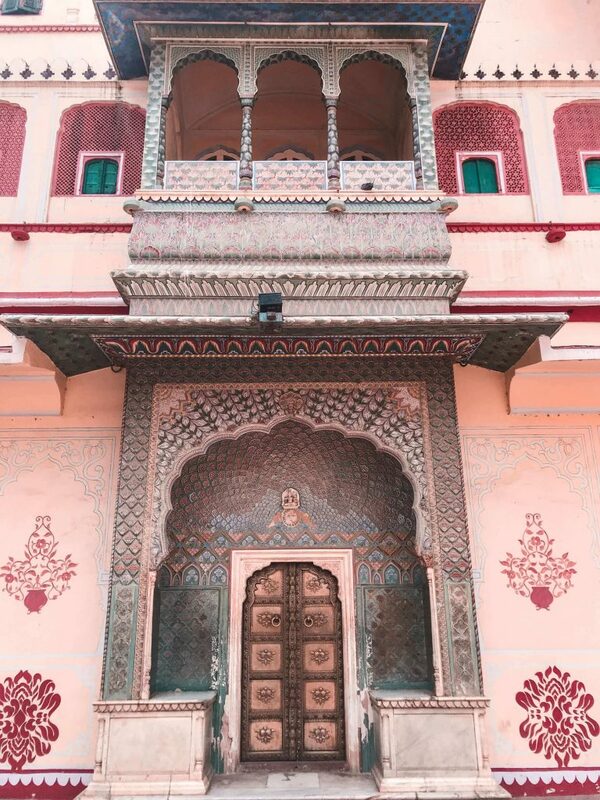 Sawai Mansingh Town Hall – This is another example of the beautiful architecture in Jaipur. 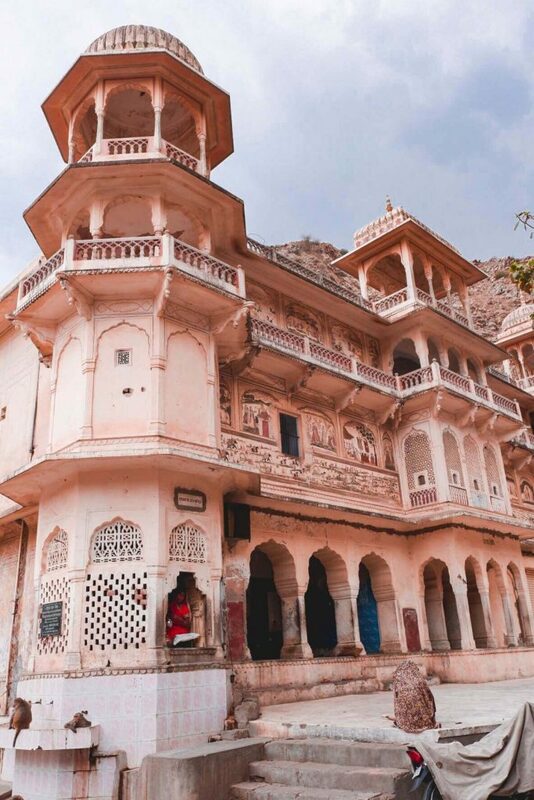 The Sawai Mansingh Town Hall is built in pink stucco and the interiors are decorated with lots of lovely traditional artworks. Maniharon ka Rasta – A good spot to buy resin (locally known as “lac”) bangles. Head inside and you might even get the chance to see one of the ladies make and shape the bangles live right in front of a fire. They melt the resin into a mold-able structure and then shape it into bangles, adding decor and gems along the way. 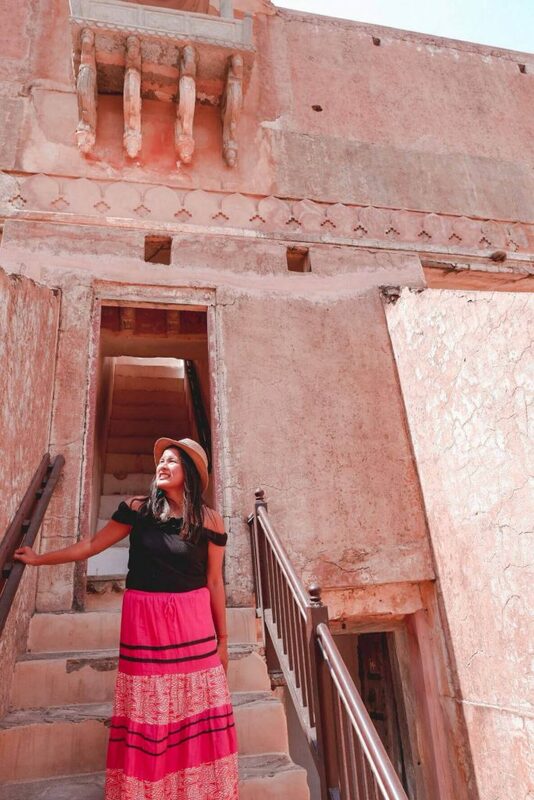 Aside from the places listed above, there are endless things to do and see in the walled city of Jaipur, in every nook and cranny – so its a good idea to go a little off trail and explore what the Pink City has to offer. 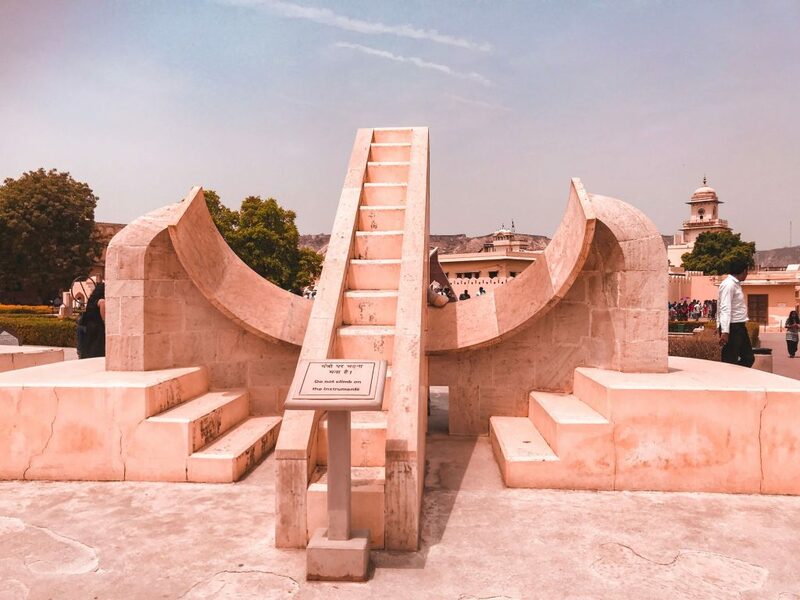 The Jantar Mantar monument in Jaipur, Rajasthan is a collection of nineteen architectural astronomical instruments built by the Rajput king Sawai Jai Singh II and completed in 1734. It features the world’s largest stone sundial and is a UNESCO World Heritage site. It is located near City Palace and Hawa Mahal. It’s one of the best-preserved observatories not only in the city but also in the entirety of India. If you’re not interested in astronomy, you might not get what the guides are talking about – if you want to know more, stay until the very end because there was a documentary presentation prepared. Don’t leave without watching it, it’ll make the 16th century structures make a lot more sense. They patterned the dials and structures like the earth so they could tell what time it was based on the positioning of the shadows. I personally found it really interesting. Plus, the documentary room was air conditioned so you don’t have to worry about sitting outside in the scorching heat. It won’t take you too long, either – it was a short and interesting presentation. Prior to the documentary I didn’t really understand what I was looking at. Since this is an outdoor exhibit, it can get pretty hot to be sure to take along a bottle of water or visit during the early mornings and late afternoons to avoid the heat. There is an audio guide available at the entrance, in various languages. Cameras are also charged extra. The Jantar Mantar is open from 9:00 AM to 5:00 PM daily. The City Palace is located in the very heart of the city of Jaipur and is where the Maharaja reigned from. It was built by Sawai Jai Singh II in the 1700s and has great historical significance. You are not allowed to take photos of the displays but you can take photos of the grounds which is also nice. 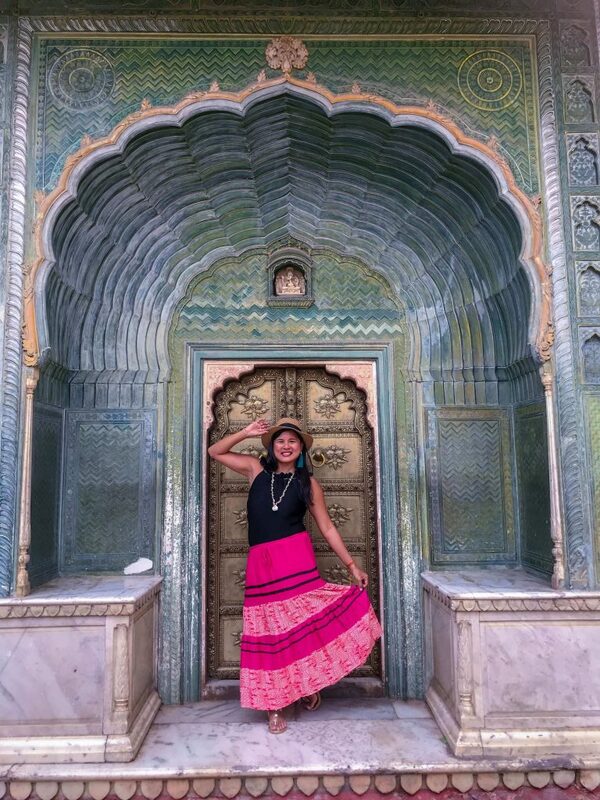 There are three decorated gates from which you can enter the city palace – the Virendra Pol, Udai Pol, and the Tripolia Gate. Commoners and visitors are allowed to enter via the Virendra Pol gate and the Tripolia Gate is reserved strictly for royalty. The palace is also known as the Auspicious Palace. It was built in the 19th century and is meant to be used as a reception center for entertaining valued guests and visitors. Nowadays, however, it is a museum with lots of different cloths and textiles up on display, even the royal formal costumes back in the day. The Chandra Mahal is a seven storey building which contains lots of paintings, mirror decor on the walls, and other ancient decorations. 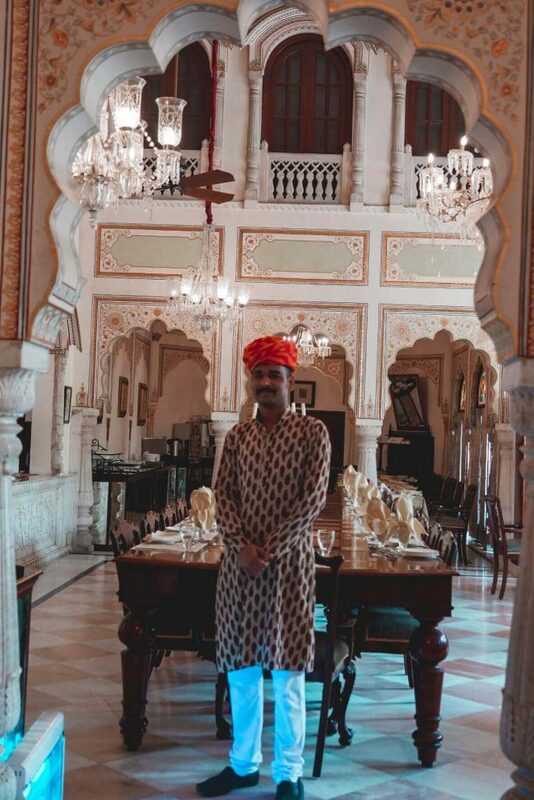 Since the building is a residence for the royal family and descendants of the rulers of Jaipur, visitors are only allowed to visit and explore the first floor. The Pritam Niwas Chowk is located in the inner courtyard, and you can find gates decorated with various symbols representing the different Hindu gods as well as the four seasons. The designs on the gates are very detailed and beautiful – it’s hard to not stop and snap a picture or two. 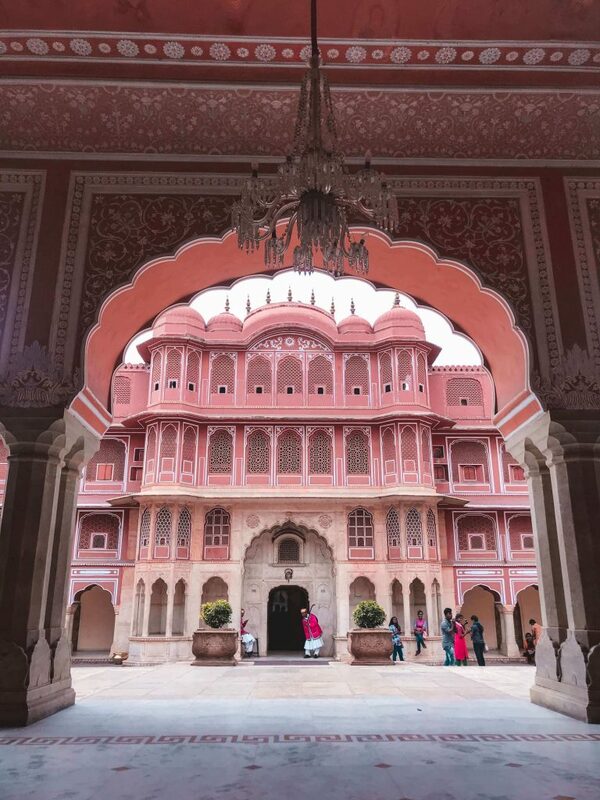 This area is the hall of public audience, where the rulers of Jaipur used to meet with the people – a place where they could voice their concerns and issues. Aside from being decorated with beautiful pillars and chandeliers, the main sight to see in this hall area are the two gigantic silver vessels made up of a whopping 14000 silver coins. The Diwan-E-Khas, on the other hand, it the hall of private audience, where the rulers held meetings with people of high positions, or other members of royalty. The decor in this area is also more extravagant, the room is painted in vibrant red and gold colors. In present time the hall now functions as an art gallery. The Maharani Palace was meant to be the residence of the royal queens. Nowadays, it is a museum where weaponry is put on display. This is a temple built in dedication to the Hindu god Lord Krishna, one of the major deities in Hinduism. It also has lots of decorations and extravagant chandeliers hanging from the tall ceilings. It honestly felt like a tourist trap, however. I kept wanting to leave but the salesmen kept showing me carpet after carpet, trying to make a sale. I enjoyed watching the way people worked but in the end, I excused myself from the shops – I explained how I wasn’t really interested in carpets because I had no use for them at the moment. He then brought me over to the other stalls to get scarves which cost around 1500 – 5000 Indian rupees which was a little bit much for me. However, the quality is really really good – unlike the usual market scarves you see on display. So, if you’re into scarves – go for it. The bangles being sold were also really pretty, there were lots of designs and colors to choose from. If you want to look or purchase a couple – you should go and check it out. As for me, however, it wasn’t really my cup of tea – I much rather prefer market shopping. I politely excused myself and told Shyam, my driver, if he could consider not taking me to the artisan shops anymore because they weren’t really my thing. However, he said that the tour guide, Salim, was required to take me there because it was government property. I was happy to take a look around but it really took a lot out of me to have to keep on saying “I’m sorry, I’m not going to buy.” over and over again. The drive to the Monkey Forest was scenic, it felt like a safari in itself. We first drive through Agra Road which is lined with pillars and monuments and all that – then we passed a forest-like area where we spotted peacocks, cows, and even blue bull. When I arrived at the Monkey Forest, I had to pay 50 rupees for the camera fee – I didn’t really mind at all. It was a small price to pay to help the Monkey Forest. 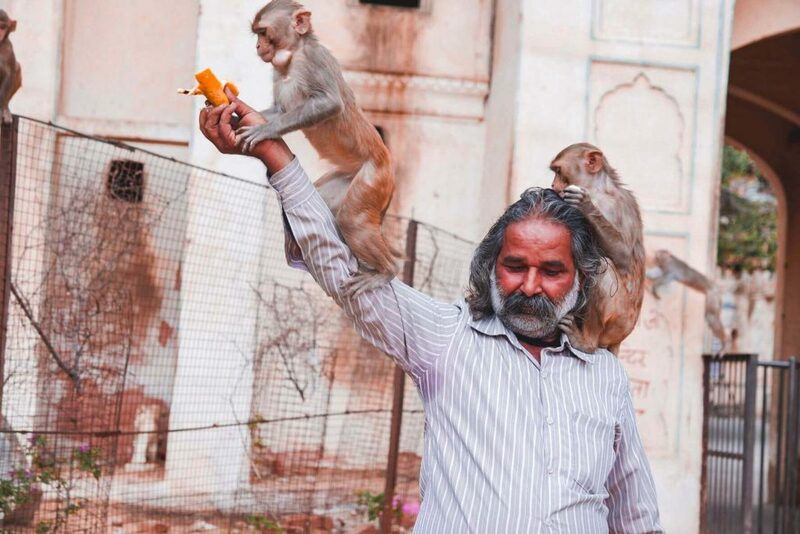 You will see a lot of monkeys inside – after all, they do call it the Monkey Temple. Try not to carry bags or bananas along – the tricky animals love to rummage through your things for food and goods. I passed by a temple, the Temple of the Sun, but I didn’t really go inside. Further along the trail, there was another larger temple: the Hanuman temple. At the Hanuman temple, you’ll be able to see a stone resembling the Hindu god Hanuman, the monkey god. Surprisingly enough, even with the abundance of monkeys, the temple isn’t dedicated to Hanuman – in fact, it is dedicated to the Elephant god. I continued to climb the steps and saw a place where people were bathing and all that – it was a hot spring so I asked someone what it was for, since everybody seemed to be happy. It turns out they were all performing an informal ritual – they told me it was for healing purposes. I made it to the top and the structures were interesting to look at. All of a sudden, rain started pouring and I ran hard because I didn’t want my camera to get wet. I took shelter in one of the gazebos with several other people and they were all really friendly. The rain took quite a while to subside so we were all just there chatting – overall it was a really good bonding moment. When the rain finally trickled down, I walked back and told my tour guide, Shyam, all about my experience. Visiting the Monkey Forest wasn’t exactly on my list when I was planning for my trip in Jaipur, but one of my Instagram followers told me about it. I’m glad she did, I liked the place a lot – especially the drive there. 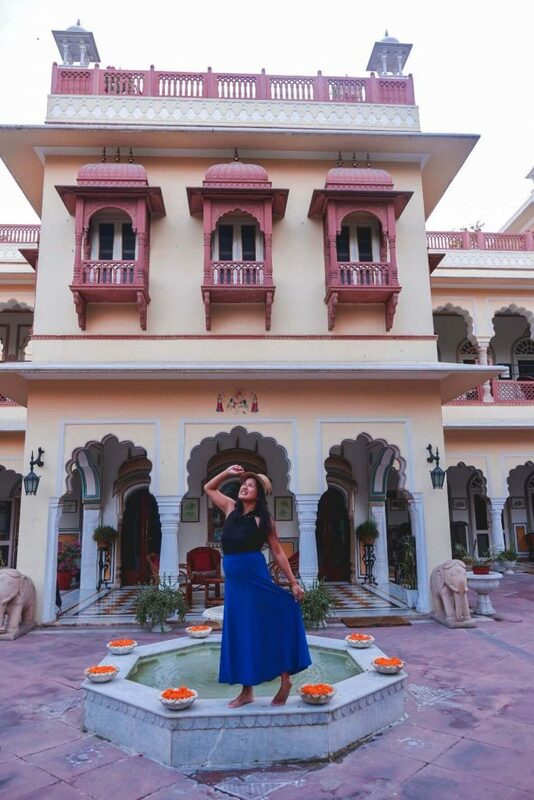 When in Jaipur, it’s a good idea to get a place to stay near the heart of the city so you can explore the different sights and sounds of the area without much transport hassle. 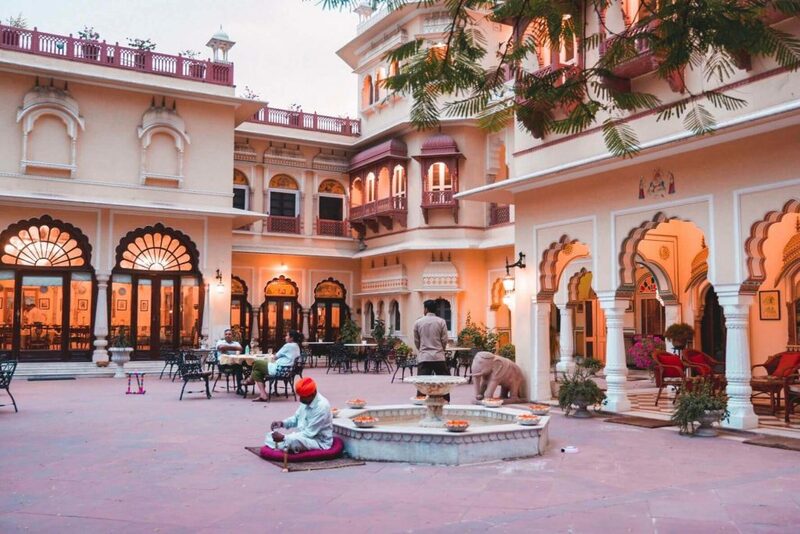 Alsisar Haveli is located in the very center of Jaipur, only a half kilometer away from the walled city, bus, and railway station. It was built in 1892 and then refurbished in 1982, decorated with the use of traditional Raiput architecture. It was a former mansion, which is why the exteriors are so large and decorated grandly. The hotel is home to a total of 47 rooms – 33 standard rooms and 14 suite rooms, all equipped with air conditioning so you don’t have to worry about sweating in the hot Indian weather. 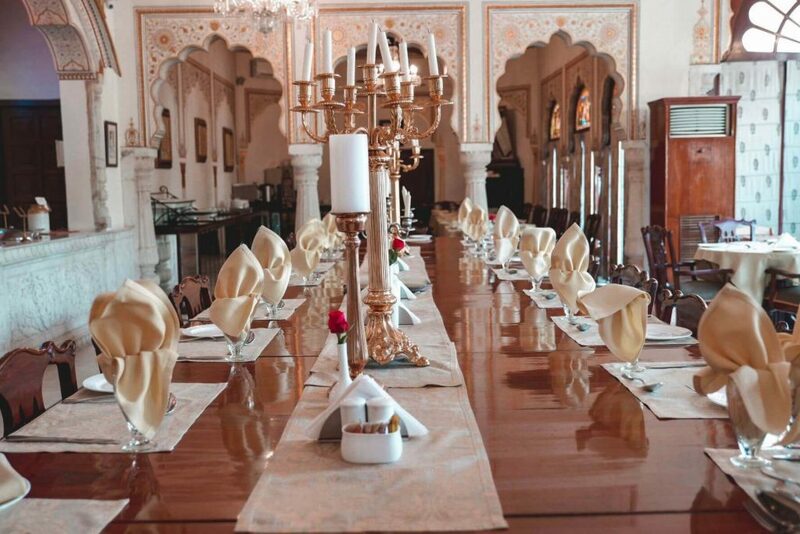 The hotel really resembles a palace – just like in the Nahargarh Palace, the dining halls are awesome and elegantly decorated. 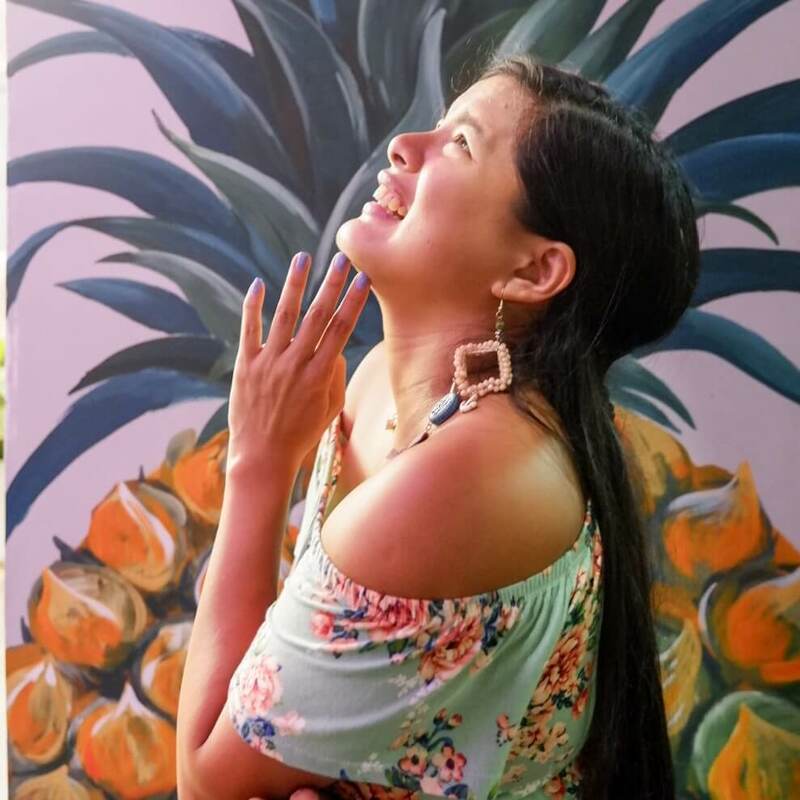 It has a traditional feel to it, especially since the staff are all dressed up in traditional wear – the food was also delicious and they even have musicians playing every day which really adds to the experience of the meal. Breakfast was already included in the initial payment. The dinner, on the other hand, cost 900 rupees plus taxes for the buffet but you also have the option to order an ala carte meal instead. I ordered some pasta and it was so good – all else aside, you can look at their buffet spread and see which dish you want to order on its own, if you’re not interested in eating at the buffet. Their menu has a very large selection – ranging from local Indian cuisine to international dishes. The bar in the area also serves up a good range of liquor. If you want to eat outside, restaurants are available just 5 – 10 minutes away from the hotel. Rickshaws to get there are really cheap as well, costing just a couple of rupees. The swimming pool is beautiful, surrounded by covered seating areas where you can just east and relax by the poolside. Aside from the pool, there are also several courtyards you can stroll around, as well as verandas. I even found one that resembled the Sheesh Mahal, otherwise known as the mirror palace I visited at the Amber fort. 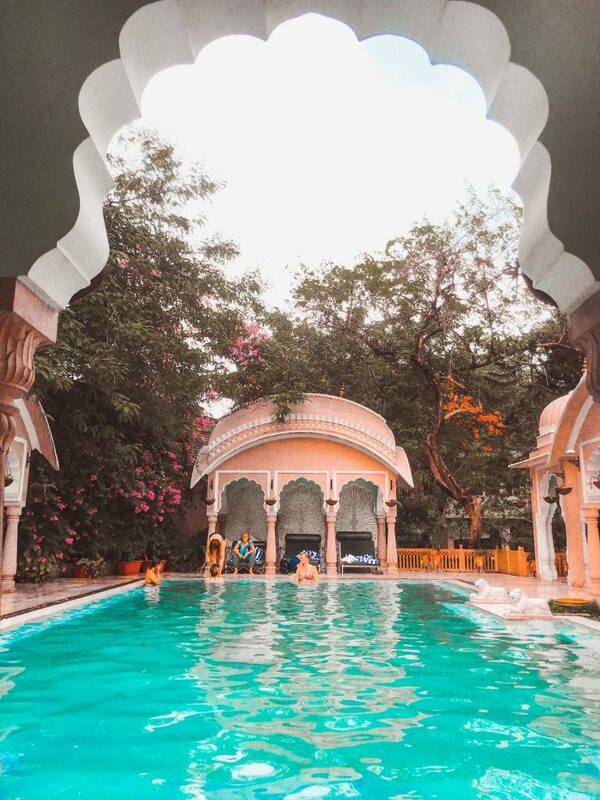 The day I arrived at the hotel was a strike day in Jaipur so we all just sat and lounged around the lovely pool – I even met a French family and made conversation, it was a nice experience. They also have a spa area, bar, laundry service and free Wifi, even a business lounge which you can book so you can host company meetings – there is a charge to use the wifi here, however. There are even puppet shows and folk dances you can watch. 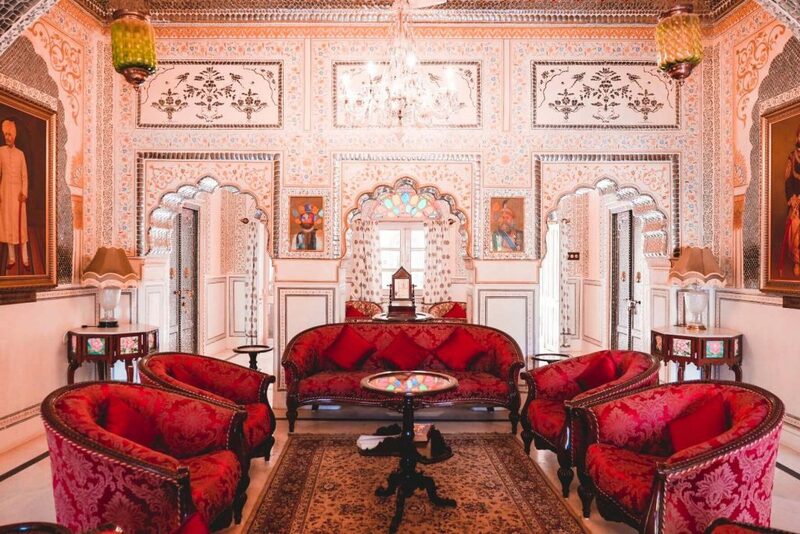 The rooms were all very grand as well, decorated carefully with traditional Jaipur decorations and designs – it makes you feel as if you’re sleeping in a bed meant for royalty. The rooms are also equipped with lots of different amenities, such as temperature control, bath tubs and hot and cold water running all day and all night. There is also cable television, telephones, chairs, study tables, cabinets and drawers – basically everything you could ever need in a hotel room. The staff were always to respectful and would always greet me with a big smile whenever I passed by. The courtyards were lovely and there were lots of seats available outside, so people usually ate out there. 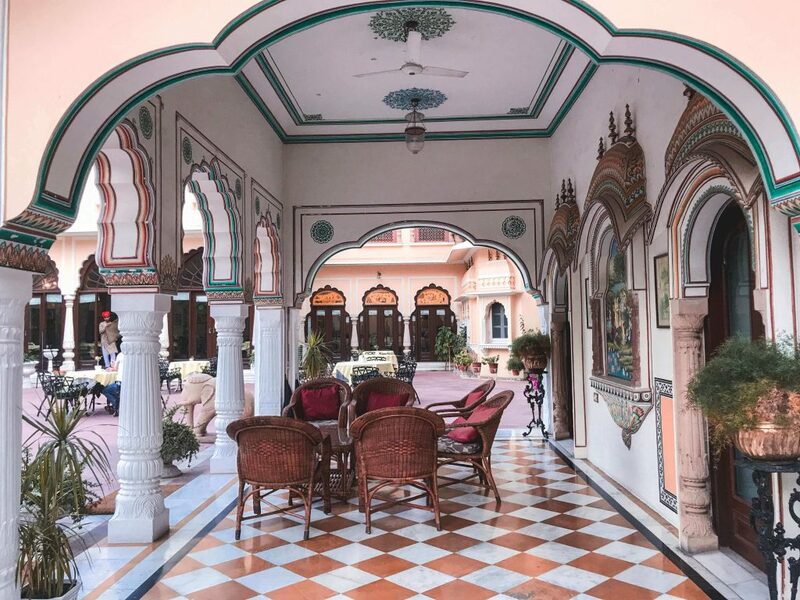 Overall, the Alsisar Haveli was a very very nice place, with lovely rooms and amenities – a night’s stay will definitely make you feel as if you’re a king or a queen living in the ancient days of the capital. 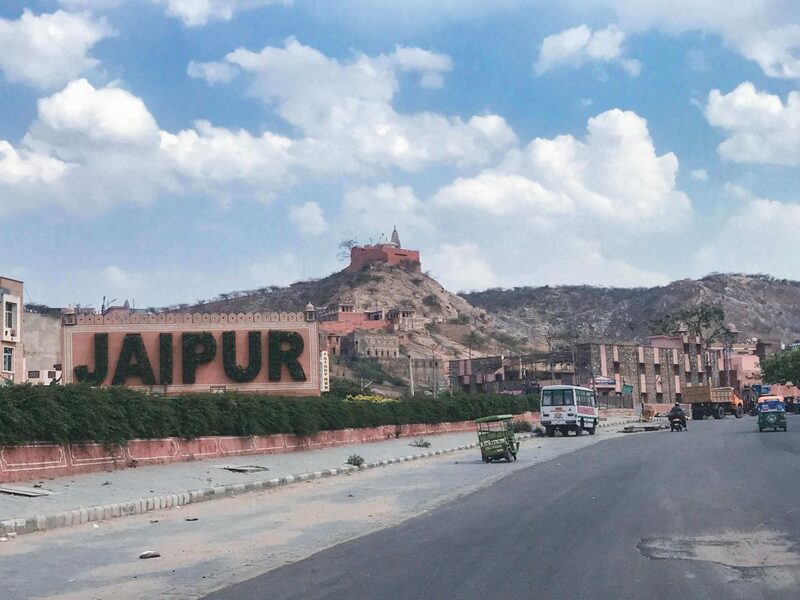 Not only that, but the convenience of the location and the ease of access to many great tourist spots makes it a top choice when staying in the city of Jaipur. How far is Delhi to Jaipur? 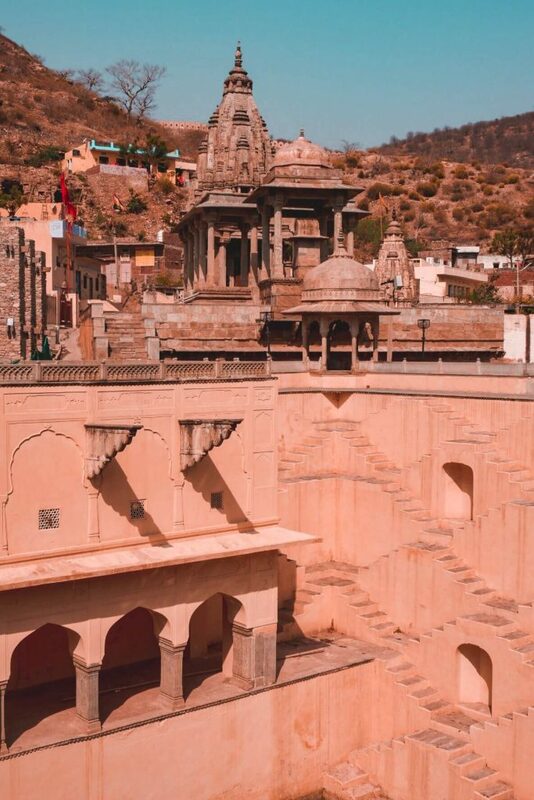 Jaipur is one of the major cities in India, meaning it is not as off the beaten path as some other areas in the country. In fact, it is one of the most frequently visited tourist areas. The city is relatively easy to reach from the capital, Delhi, and you have a wide variety of transportation options to choose from, depending on your schedule and preferences. 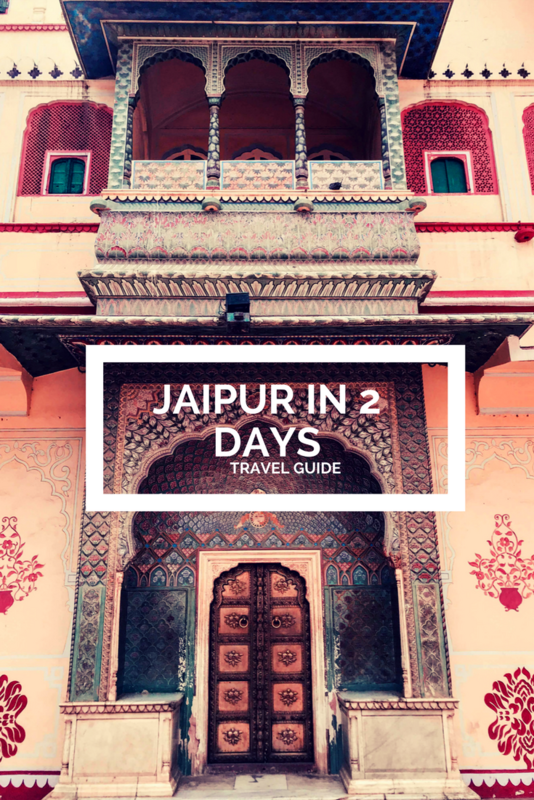 Jaipur is a good way away from the capital at around 280 – 290 kilometers away from Delhi, and there are three ways you can get there: By air, by train, and by road. If you aren’t interested in going on a road trip, then a flight is your best bet – it’s convenient and fast, although tends to be a little on the pricey side. You can try and snag a deal during the off-season, however. The flight takes a total of around one hour and you can get a ticket by booking a flight at the Indira Gandhi International Airport, the largest airport in the country. The train is another great way to get to Jaipur from New Delhi. You can catch one at the New Delhi Railway Station or the Old Delhi Railway Station. You can also ride the Delhi Sarai Rohilla Railway Station in north Delhi. The fare varies depending on the type of train you decide to board, as well as the class you will be booking. Did you like this post? Save it for later. Jaipur looks fascination. I love the detail at the amber fort. With regards to train travel, what is the difference between the classes and how much does it cost? What a beautiful city. Her titles of the “Pink City”, and the “City of Gems,” are apt. The architecture is so lovely and it is just about 4 hours from Delhi. A very comprehensive post. 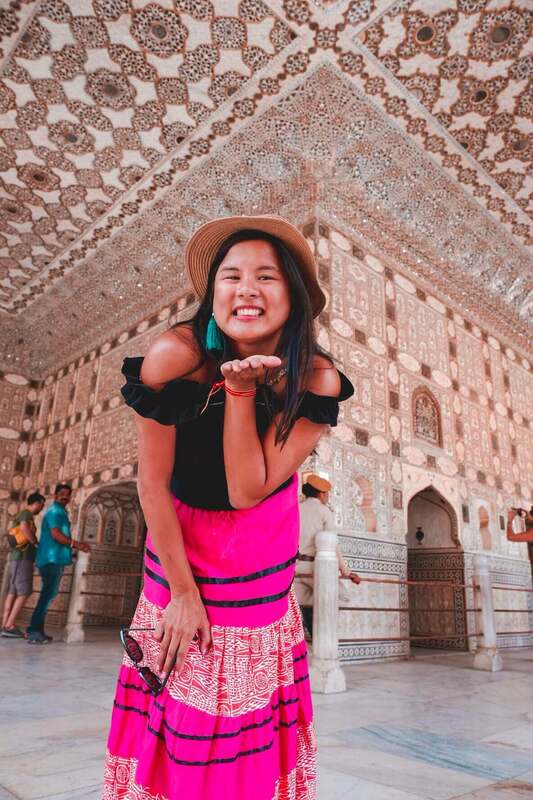 This is a great overall guide to Jaipur, I especially love your details and photos for the Amber Fort and Hawa Mahal. How many days would you recommend allowing for Jaipur? 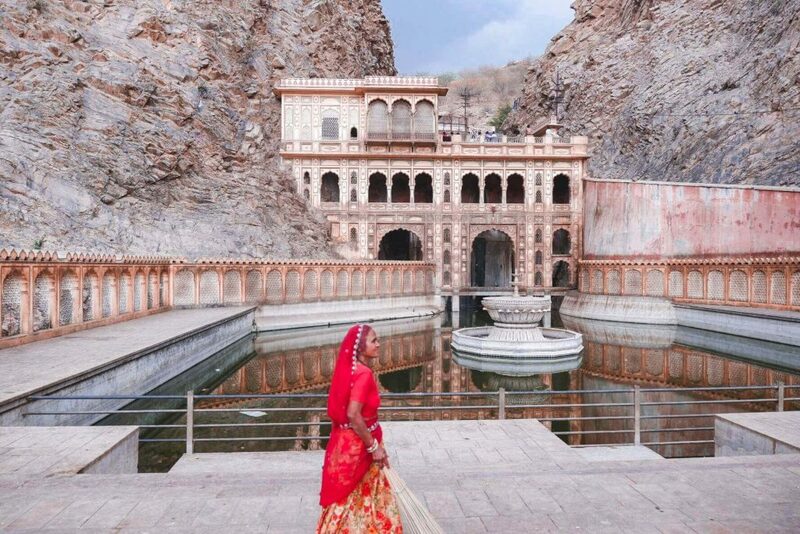 wow Jaipur looks absolutely gorgeous! 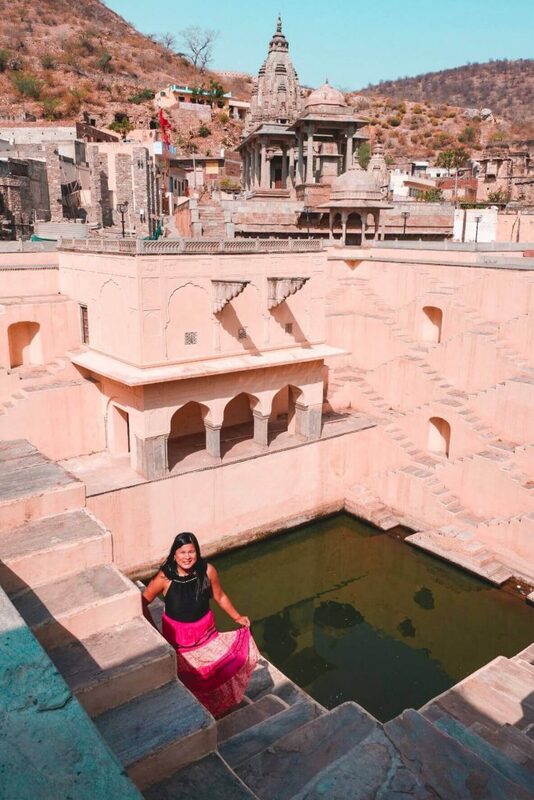 I actually never really had India high on my list of places to visit but your pictures have completely convinced me that I need to add India but specifically Jaipur! 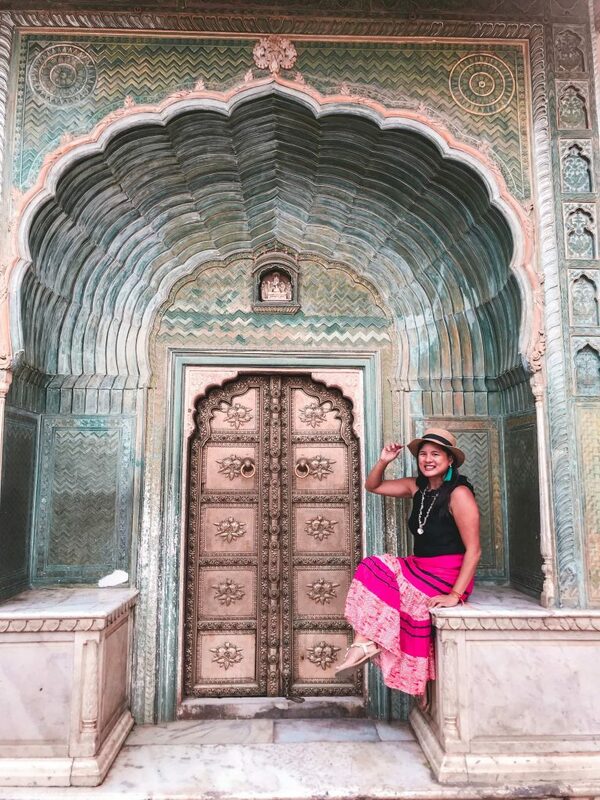 Jaipur was one of my favorite cities in India! I went to the Amber Fort and Hawa Mahal, which I saw lit up at night. It’s such a beautiful city. 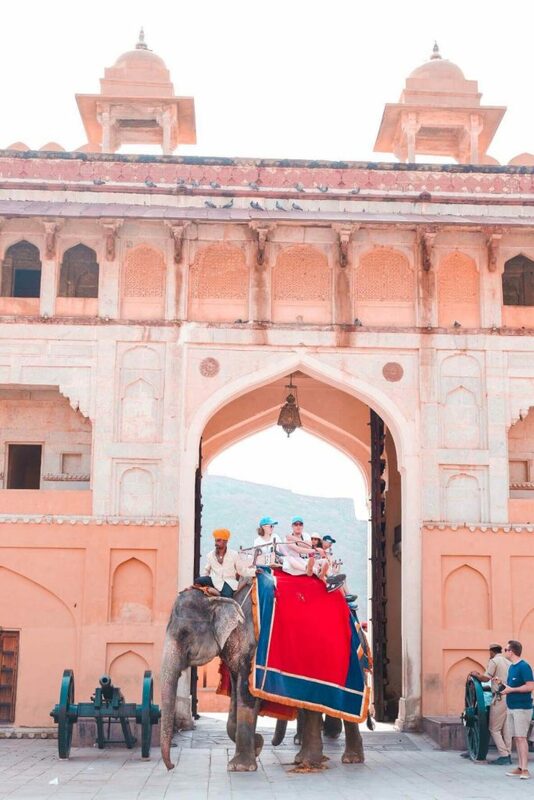 We are hoping to visit India next year and were considering Jaipur as one of our stops. 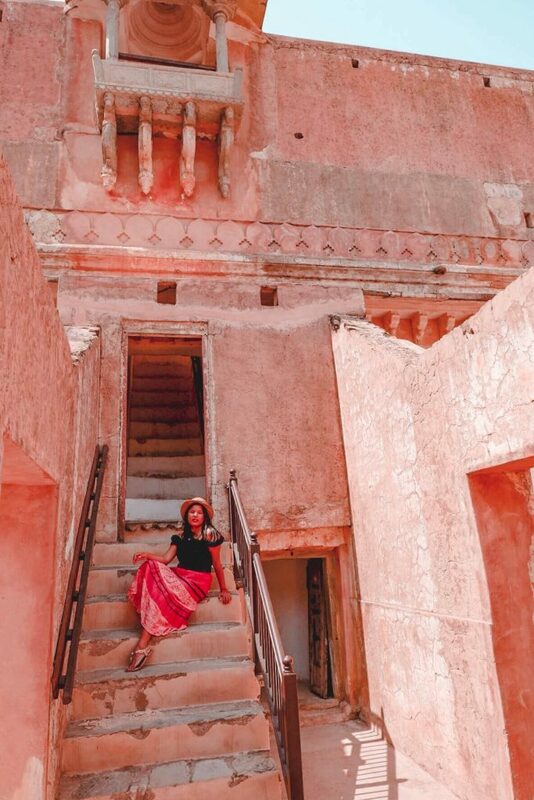 We love the shades of red of the architecture and the ornate Indian designs. Great info about visiting regarding the opening times and prices, we notice they charge for cameras, if you hadn’t told us we would’ve thought it was a scam. Well, my driver warned me about it so I guess its really a thing. I was thankful that my driver kept looking out for me and informing me all these things before hand. Wow, it’s amazing all you got to see in only two days! Especially since it shows on the pix that it was hot. I adore the picture of the lady at the Monkey Forest – so beautiful. Good to know that it’s less than 300 km zu Delhi. 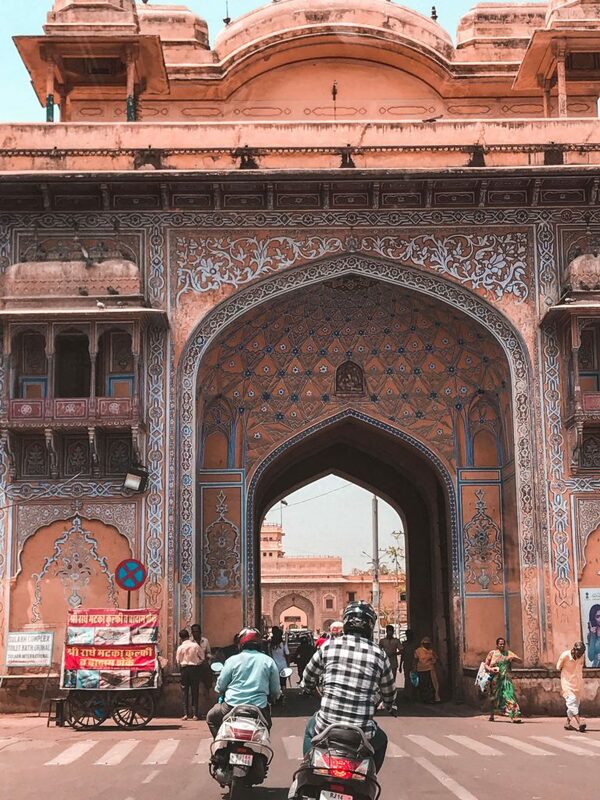 Jaipur looks like a gorgeous city! Thank you for such an informative post. There are so many beautiful architecture I would love to explore! 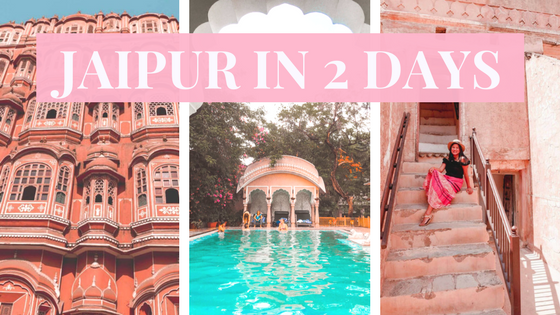 I’ve been seeing more of Jaipur on Instagram and it definitely made me want to go! It looks so interesting and gorgeous! I want to see Amber Fort in person! You definitely should. It was one of my favorites. Wow! Your photos look stunning. Also, if I do so much in two days, will our schedule be too tight?